One of the beautiful aspects of life is its unpredictability. That being said, it’s the unpredictable moments that can sometimes leave you wanting for money. Like most of the population, your monthly income likely has a multitude of expense it’s allotted to and save a little here and there for discretionary spending, it might not have much wiggle room. Unfortunately, whether we like it or not, incidents like medical emergencies, car malfunctions, and myriad other unexpected expenses, happen and usually have a price. While you could put said expense on your credit card, anytime you can save yourself from racking up more debt is always a positive. So, instead of opting for the piece of plastic resting in your wallet, you may want to consider earning a surplus in its place. Next time you’re in a bind, consider trying one of these eight legit ways to make cash fast. Just because you’re no longer a teenager doesn’t mean you can’t enjoy the benefits of babysitting or petsitting. After all, who wouldn’t want to take care of an adorable puppy or a couple of cute kids? Getting paid to do so makes an enjoyable task that much better. Ask around with friends and family to see if anyone needs the assistance. And if you can’t find anyone or don’t have a connection, try signing up for Rover to find petsitting gigs or care.com to babysit. Whatever you choose, it’s a quick job that you can work around your normal schedule for some extra income. More likely than not, you have a surplus of home goods, books, electronics, furniture and clothes that you either no longer need or use or never used to begin with. Everyone can stand to declutter their lives every now and then, and if you need cash fast, why not take the opportunity to clean up and make money? Through the use of strategically-placed yard signs pointing the way to your house, some well-organized tables, and price tags, you can easily throw a yard or garage sale. While you can’t price items too high, depending on how much your looking to make, you should yield a couple of hundred dollars at the least. In a world where you’re already online for a good portion of your life, you might as well make money while doing so. Sites like Swagbucks, Pinecone Research, and Opinion Outpost allow you to answer surveys in exchange for money. Simply sign up and you’ll be on your way to earning quick cash by simply filling out a form. Most surveys will earn you anywhere from $3 to $5, sometimes more! Of course the longer the survey, the more you’ll earn. Nonetheless, taking a few hours out of your day, a couple times a week, could earn you a little cushion when in need. Uber and Lyft seem to be quickly surpassing the good-old taxi and exist just about anywhere. If you have a working car, you may be able to earn cash by picking up a few extra passengers on your drive. Becoming a driver-partner with either company starts with signing up and completing the background check process. The best part about driving with Uber or Lyft is that you can form it around your schedule. You can drive when you want, and opt to drive during the busiest times, which will ultimately earn you the most. If you live in a busy area and don’t mind picking up passengers for a couple of hours, then opting to drive with a ride share company can be a lucrative way to earn extra money. This might sound like an odd suggestion, but if you don’t mind letting strangers use your car, home, or even a room, listing those items online can provide you with extra cash. If you carpool, bike, or have an extra car to put to use, sites like Turo help you rent out your car for the day or longer. As something that’s of no cost to you, Turo, depending on various factors including length of time, location, and the value of your car, can help you earn at least a couple of hundred dollars a day if not more. Furthermore, you can list a room or your home through sites like Airbnb. If you’re particularly handy at small home fixes, or don’t mind seasonal yard work, like raking leaves or snow removal, offering your services to friends, family, and neighbors can be a great way to make money. Most people don’t necessarily want to perform those tasks themselves, which is why they’ll likely be more than happy to pay you to do it instead. Like yard work, the majority of the population either doesn’t want to or doesn’t have the time to fully clean their homes. By offering to clean houses at a competitive rate, you’ll no doubt have an array of takers and be able to earn money by simply dedicating a couple hours a day to merely cleaning. While this might not work for everyone, if you have a particular skill or craft that you’re particularly good at, you can probably earn money by doing so. Whether you can write, edit, or code for freelance, offer your IT skills, or even craft, like knit or sew, there’s bound to be someone who will be glad to use your services. Offer your services on sites like Etsy or Craigslist, or ask around to make contacts and you’ll be in busy for yourself and earning cash before you know it. When you need cash quick, it’s hard to know where to turn or how to go about it. That being said, you don’t have to rack up debt, ask family, or take out a loan if you don’t want to. By simply being a little creative and advertising your services, you can find an array of avenues in which to make cash fast. 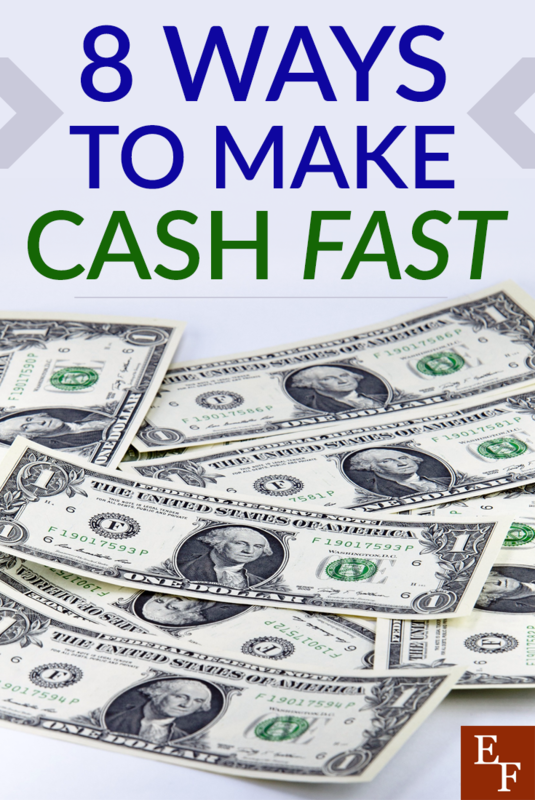 Have you tried any of these ways to make cash fast? What have you found to be most lucrative?